The concentration of the inlet wastewater of urban sewage treatment plants is much lower than the expected level in the design stage, mainly because of the problems of construction, management and maintenance of the drainage systems. Through investigation of the urban drainage pipelines, primary problems of drainage network damage, local unreasonable elevation design, pipe blockage and drainage system confusion, etc. were found. Combining the local actual situation, some corresponding engineering and management measures and some feasible suggestions for drainage pipe construction, management and maintenance are put forward. Why are voids filled with lightweight infilling material in raft foundation of pumping stations? To reduce the dead load and hence to reduce the settlement of pumping stations, the voids inside the raft foundations are filled with light material. If instead concrete is placed inside these voids, it poses severe thermal cracking problem and drastically increases loads to pumping stations. The use of general fill is also not desirable because its self-weight is comparable to that of concrete. On the contrary, if these voids are left vacant, water may penetrate into these voids during future operation and increases the dead load of pumping stations during its normal operation. Therefore, lightweight infill material, which is non-water-absorbing and non-biodegradable, is designed inside these voids to avoid ingress of water and to reduce the dead load of the structure. In the construction of pump troughs for accommodation of screw pumps, what is the construction method to ensure close contact between the screw pumps and the pump trough? In the construction of screw pump troughs, trapezoidal-shaped troughs are usually formed by using normal formwork. In order to enhance close contact between screw pumps and troughs, upon lifting the screw pumps into the troughs screeding works is carried out. Screw pumps are set to rotate and screeds are placed between the gap of screw pumps’ blade and trapezoidal-shaped troughs during the rotating action of screw pumps. After the screed sets, it serves to prevent leakage of water during the pumping operation of screw pumps. In the design of corbel beams in a pumping station, why are shear links designed in the top 2/3 of the section? What is the general advice on the design? Corbel beams are defined as z/d<0.6 where z is the distance of bearing load to the beams’ fixed end (or called shear span) and d is depth of beams. 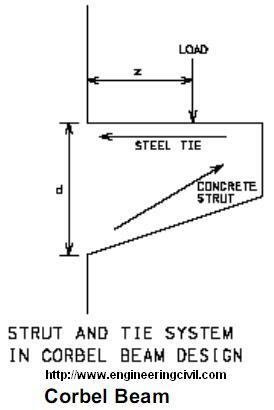 The design philosophy is based on strut and tie system. To establish the design model, it is firstly assumed the failure surface, i.e. shear cracks extending to 2/3 of depth of beam. Experiment results verified that the failure cracks extended only to 2/3 of beam while the remaining 1/3 depth of concrete contributed as concrete strut to provide compressive strut force to the bearing loading. Horizontal links are normally provided to corbel beams because experimental results indicated that horizontal links were more effective than vertical links when shear span/depth is less than 0.6. For shear span/depth>0.6, it should be not considered as corbel beams but as cantilevers. In designing corbel beams, care should be taken to avoid bearing load to extend beyond the straight portion of tie bars, otherwise the corners of corbel beams are likely to shear off. Reference is made to L. A. Clark (1983). What is the difference among cement plaster, cement render and cement screed? Under what situations should each of the above be used? The purpose of plastering, rendering and screeding is to create a smooth, flat surface to receive finishes like paint, wallpaper etc. Plastering is the intermediately coating of building materials to be applied on the internal facade of concrete walls or blockwalls. Rendering is the intermediate coating for external walls only. Screeding is the coating laid on floors to receive finishes like tiles, carpet, and marble.